Shopping for Lost Bobble Heads? Hey, it's crazy, squirrely Claire! SDCC Exclusive wobbler out of the Lost TV series. Limited edition of 1,500 pieces! Crafted by Bif Bang Pow! An Entertainment Earth San Diego Comic-Con International Exclusive! Is that sweet, innocent Claire? And what's that thing in her hands? Well, she's not sweet and innocent anymore! Sporting rugged island gear and a shotgun, here's Claire with none other than her "baby" made of an old rotten skull and the fur from dead animals. Hey, it's all she's got, OK? 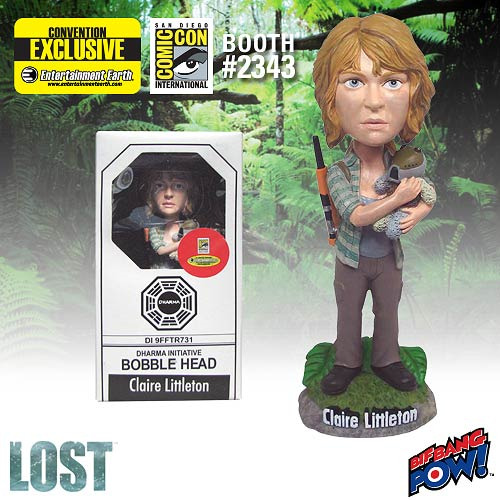 This sensational Claire Littleton Bobble Head stands 7-inches tall, is finely crafted of resin, and features superb detail that's accurate to the mega-popular Lost TV series. She's a limited edition of 1,500 pieces that belongs in your collection.